When registering a company, the jurisdiction of the registration can make or break the company’s performance. There are several issues that revolve around the jurisdiction for example statutory requirements, foreign ownership policy, ease of incorporation, costs of registration, taxation and policy on foreign workers. The south Asian countries of Singapore and Malaysia are both attractive destinations for foreign investment. Both countries are ranked top 25 in the ease of doing business by the World Bank. Most foreign investors will be torn on where to take taking their money. How do the two compare in setting up a company? At least two directors who are natural persons of a minimum 18 years of age. If the company is investing in a restricted sector like oil and gas one of the directors must be a Malaysian resident meaning a Malaysian Citizen, a Malaysian Permanent Resident, a person who has been issued a Malaysian Employment Pass. The directors must not be bankrupt or have been committed of an offence and jailed for more than 5 years. A natural person company secretary who is a professional belonging to a professional body recognized in Malaysia by the Minister of Domestic Trade and Consumer Affairs, or licensed by the Companies Commission of Malaysia. At least two shareholders and a maximum of 50 shareholders. Directors can serve as shareholders. A shareholder can be a natural person or a corporate entity. A minimum of 1 natural person of a minimum 18 years who is a local resident director meaning a Singaporean Permanent Resident, a Singapore Citizen, a person with an Employment Pass, an Entrepass, or a dependent Pass. The maximum number of directors is unlimited. At least 1 shareholder and a maximum of 50 shareholders. A director can also be a shareholder. A corporate entity can also be a shareholder. A natural person professional company secretary with credentials recognized in Singapore. In Malaysia, a foreigner intending to hold more than 30% shareholding in a company must get approval from the foreign investment committee. 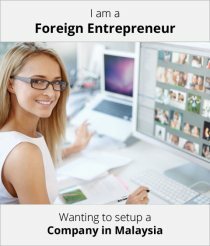 In Singapore, a foreigner can hold 100% ownership in a company without seeking any approval. Both Malaysia and Singapore do not have visa requirements for foreigners incorporating companies without the intention of relocating. The foreign shareholders can attend to company matters while on short stay visas. 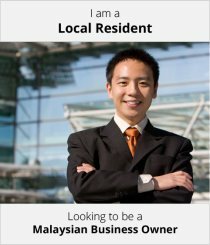 A foreign entrepreneur planning to relocate to Malaysia must obtain an employment pass. The foreigner must show that the company has RM 500,000 in paid up capital if it is 100% foreign owned, and RM 350,000 if the company is a joint venture with local Malaysian partners. A name search must be done and approval obtained before using that name for a business entity like a company. The request is done to the Companies Corporation of Malaysia (SSM). The process can be done online on the SSM’s MyCOID portal. A nominal fee is paid per name searched. The approval or rejection notice is issued in 1 working day. The company secretary must submit incorporation documents to the SSM within 3 months of the approval of the company’s name. This can also be done online or in person. The SSM issues a Certificate of Incorporation in 1 day if the documents are filed properly. The company must register with the Royal Malaysian Customs to obtain a Goods and Services Tax number where applicable which is if the company has a turnover exceeding RM 500,000. The number is generated in 2 weeks. The company must also register with the Inland Revenue Board to obtain a tax number. If the company is hiring local employees it must register with the Social Security Fund and the Employee Provident Fund. A name search and approval must be obtained before registration. The application is done online on the Company Registrar’s website. The approval or rejection is done on the same day. The incorporation documents must be filed with the company registrar within 90 days of the name approval. This can be done online. The company registrar sends an official email showing the company’s registration number. The email serves as the Certificate of Incorporation. The company must apply for a Goods and Services Tax number issued by the Inland Revenue Authority of Singapore. This is applicable where the company is expecting to make an annual company turnover exceeding SGD 1 million. In Malaysia, a company can be incorporated in 2-3 days with the rest of the requirements like GST application coming after incorporation. In Singapore the incorporation is also possible in 2-3 days. In Malaysia, the costs of registering a company depend on the authorized share capital of the company. The costs range from RM 1,000-70,000. In Singapore, the fees are SGD 315 for any amount of authorized share capital. Companies with more than 20 shareholders must submit audited annual tax returns to the Inland Revenue Board within 7 months of the end of the financial year. The returns must also be filed within 1 month after the Annual General Meeting. Companies with less than 20 shareholders must also file annual returns but are not required to have them audited. All companies must submit audited tax returns to the Company’s registrar by 31st October of each year. The returns must be filed within 1 month of the Annual General Meeting. Companies with an annual turnover of at least or less than SGD 5 million, and those with less than 20 shareholders are exempt from submitting audited returns but they must submit their returns.